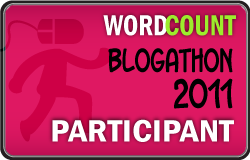 So it's all pretty exciting--the blogathon has started and already I got two visitors (welcome back!!) --As the month goes on, we all tend to start visiting each other's blogs, and I know I find new favorites. First some of my own old favorites--start with yesterday's visitors, Jan Udlock's Blog--she is one of the people who help Blogathon happen, and she's discovered a new career in it, a career as a virtual assistant. Who knew? Two Hands and a Road Map always makes me smile. Bike with Jackie inspires me. I "met" Van on last year's Blogathon--he was my second guest poster (he had already committed for the Blogathon, so posted for me in June) and talked about foraging and cooking...he had a "failure," but I wanted him to post it anyway, because I have failures in the kitchen, too (please see: Epic Fail). Blogathon and Van's Speed River Journal helped him find his way back to professional freelance writing. I read Annie Logue because she makes me smarter. The list is long...I plan to visit all the blogs this year, and I'll feature different sites once a week--link-back love, as it were..
Let me hear your favorites.